Created to offer superior performance, Synthetic Paper has an attractive finish that is waterproof and tear-resistant. These qualities make Synthetic Paper the perfect solution for the most difficult applications in the most hostile environments such as outdoor and production signage. Synthetic Paper is ideal for a wide range of applications where printed items are exposed to contamination, heavy handling or extreme weather conditions. Synthetic Paper has an attractive matte white finish that is suitable for use in all electro photographic dry toner applications such as Digital Presses, Color Copiers, and laser Printers. This new product is also suitable for use in traditional printing applications like; Offset Lithography, and Flexo Printing, however special fast drying inks may be required for these purposes. Typical uses for Synthetic Paper include menus, business cards, luggage tags, membership cards, marathon bibs and countless others. Synthetic Paper is a heat stable, white, high grade polyester paper coated to except toner applications (not suitable for ink jet printers). Transcript: This is an overview of Synthetic Paper! At first glance, synthetic paper looks like your standard printer paper. It is close to the same thickness and color, and prints come out looking the same. Normal paper is very easily ripped and wrinkled, while synthetic paper holds up under the same extreme conditions. Synthetic paper is not suitable for inkjet printers, but most any other printer will work. 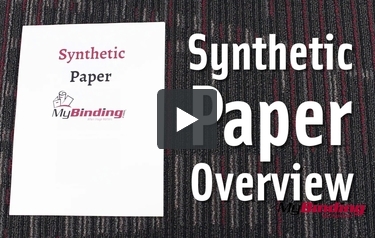 This is an overview of Synthetic Paper! Do note, that in exiting the printer, your pages will most likely stick to each other from the static electricity created. Simply removing them will keep them from sticking together. Or have a static remover on your printer. It bends and acts like normal paper. If you can’t tell, the synthetic paper on the right. One of the biggest differences is that standard 20 pound paper is slightly see through—this synthetic paper is completely opaque. Between the two pages, it’s almost impossible to tell these basic prints apart from one paper to the other. Again, standard paper, and synthetic paper. Of course, it is also waterproof. Water simply runs off the page, and the ink does not smudge from the moisture. The paper is easily cut, and once this happens, it is then easily rip from that spot. The pages resist folds as well, never really folding flat as seen here. Even within an inexpensive binding machine, synthetic paper punches cleanly. And of course, like any normal paper, you can also write on it with your choice of writing utensil. The pencil, and only the pencil will smudge slightly. With some basic tests we can see how well synthetic paper will hold up. Add in a high quality printer and you could have some a great looking projects that will hold up within heavy use. Can this paper be used to transfer a photo to wood? Thank you for your question. Unfortunately you would not be able to use Synthetic Paper to transfer a image directly onto the wood. It would be suitable to print on for outdoor posting though. I am using this with small children, I see this is waterproof. Would they be able to tear it up? This paper is great for small kids. It is waterproof (Which we have tested in this office) and it is also tear proof. We have had the strongest of the strong try and tear this paper. I think it would work great for whatever you are working on.